RoyalEnfields.com: What's missing from these Royal Enfields? 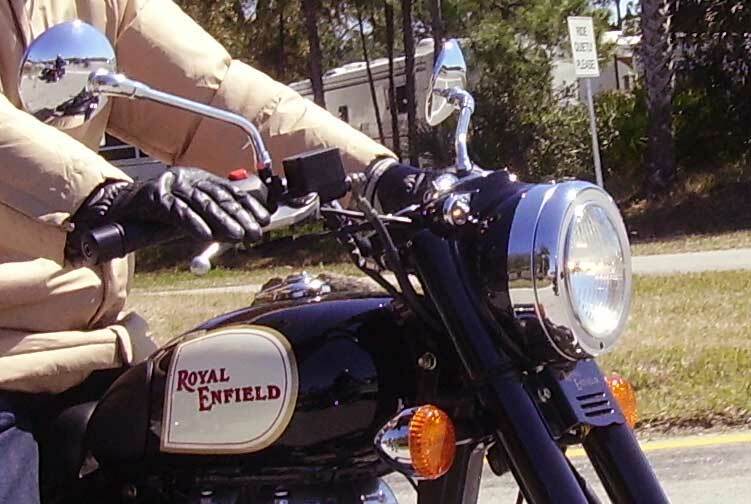 What's missing from these Royal Enfields? 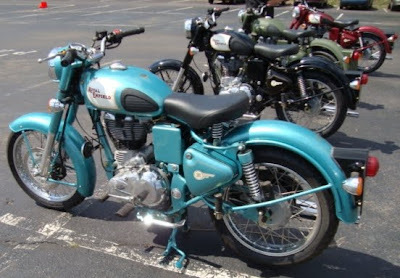 Four brand new Royal Enfield C5 motorcycles went up for auction on eBay recently. There was one in each color: black, red, green and military Battle Green. But there was something else different about the motorcycles. Before taking the picture the seller did something to them to make them look more appealing in the photos. He left something off. Do you realize what's missing? Twin City Bikerstuff in St. Paul, Minn. put the four brand new Royal Enfield C5 motorcycles up for auction. Perhaps they just didn't complete assembling the bikes, perhaps because leaving off this item makes the motorcycles easier to move and store inside the building. The mirrors. Where are the mirrors? The mirrors that come with the C5 are high mounted and provide a good view of what's catching up to you. They are surprisingly free of vibration blur. And they are good looking. But there is no arguing that the motorcycle, in fact any classic motorcycle, looks better without mirrors. In our mind's eye, the top of the motorcycle should be the hand grips — sleek is always better looking. The same goes for the rider, too, of course! I guess this is why we have bar end mirrors! Agreed. I never liked the Mickey Mouse mirrors. I didn't notice the missing mirrors. I noticed that they all have single seats (like mine). I think RE's look better with a single seat instead of the stock dual seat. And, I have bar end mirrors. I noticed the mirrors right off (i bump into mine at least once a week). I was going to suggest that you do a blog on "what's missing from your Enfield?" and ask for inputs. But I realized that might take a week or two to compile and you would have ended up with about ten categories (like, "what you took off on purpose" and "what you found missing at work that was there when you left home"). Anyway, thanks for the blogs you do write. The Mickey Mouse mirrors came off my bike about 3 minutes after I unloaded it from the trailer upon returning from the dealership. I have a bar end on the left side only...looks much better! Lots of head checks.